Wishing you a wonderful day today, filled with people who you love and who love you! Happy Post-Valentine’s Day weekend, everyone! 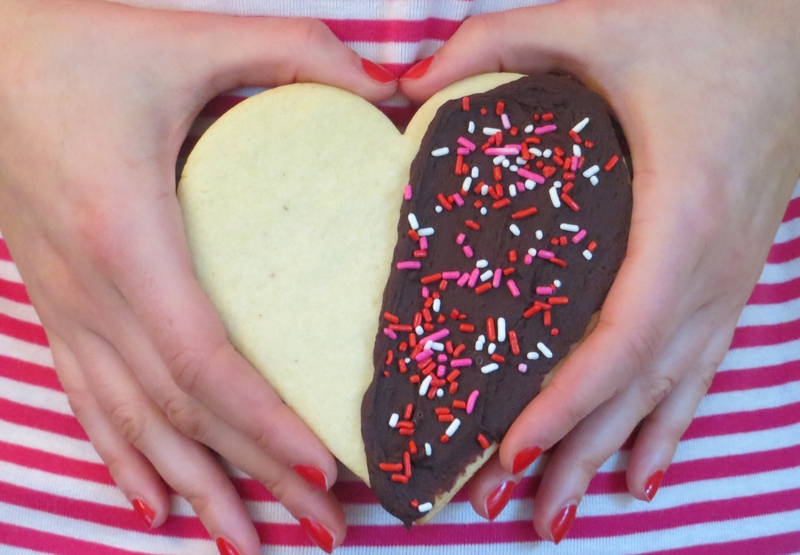 I hope you had a wonderful day (and weekend) full of love, family, and chocolate (of course!). 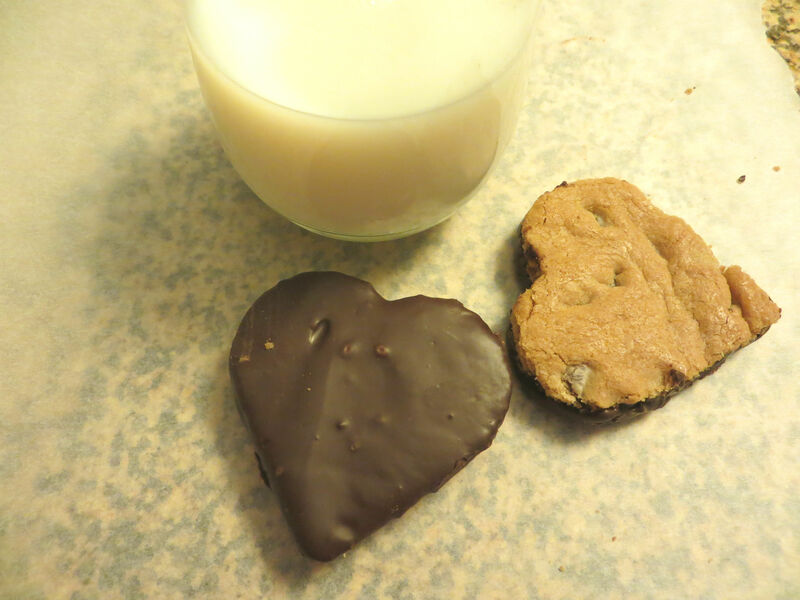 My Valentine’s Day was composed chocolate, medical nutrition therapy studying, snow, chocolate, internship applications, snow, and cookies, lots and lots of cookies. 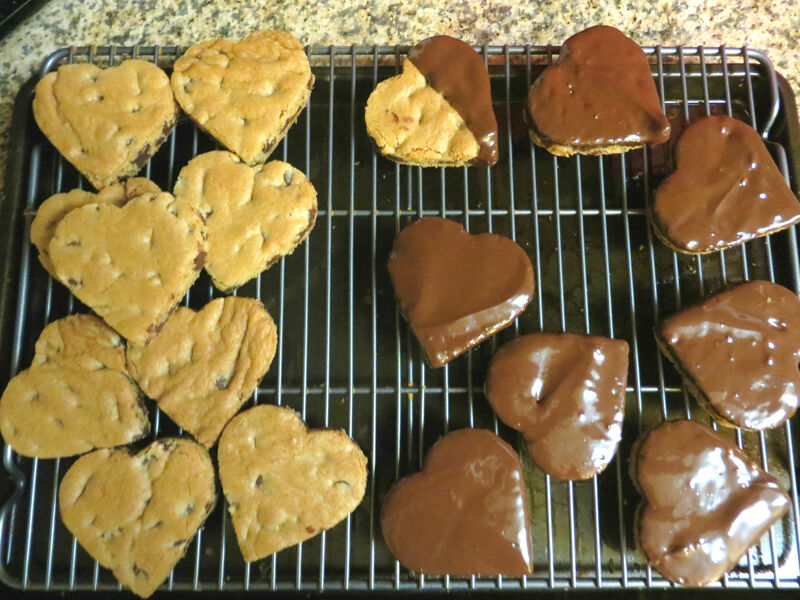 My friends and I were postponing our Valentine’s celebration a day so that we could submit our internship applications by the deadline, so I had a little time to take a break and immerse myself in a heart-themed baking project. These treats are simple and can be made for any holiday, season, whim, etc. All you need to do is grab your favorite cookie dough (and it can be from the refrigerated section of the grocery store… I won’t tell) and let it get slightly soft. When the cookie dough is soft-ish, spread it out in an even layer on a parchment-lined half-sheet jelly roll pan (you need at least 1” sides!). Bake the cookie dough for about 15-20 minutes until it is done and cool it completely. Then take your trusty, rusty cookie cutter and go to town! Since I was making a regular and a gluten-free version (the GF was a mix! ), I made sure I chose two heart-shaped cutters that looked completely different so I wouldn’t mix the two up and make my friend sick. Friends sick from your cooking – not awesome. Look how pretty they turn out! 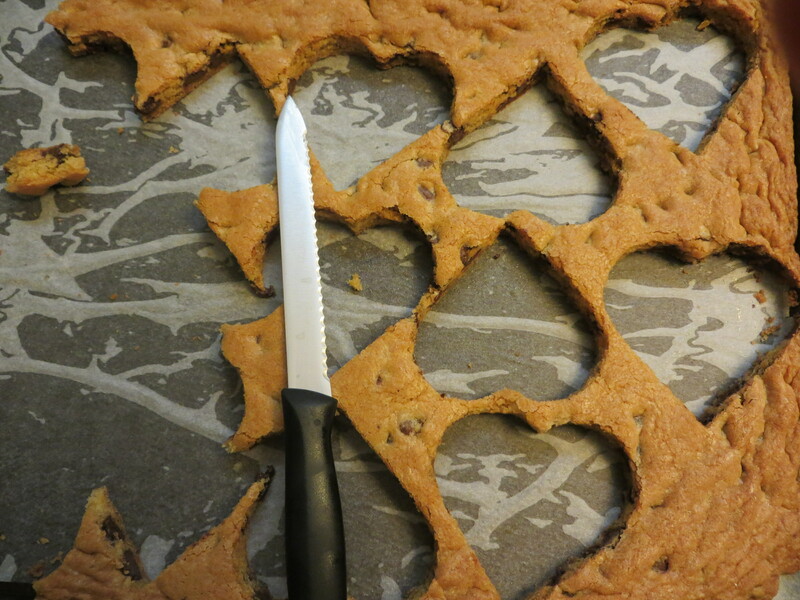 And the leftover cookie edges can be frozen for later use – ice cream toppings, ice cream mix-ins, midnight fridge raids, etc. 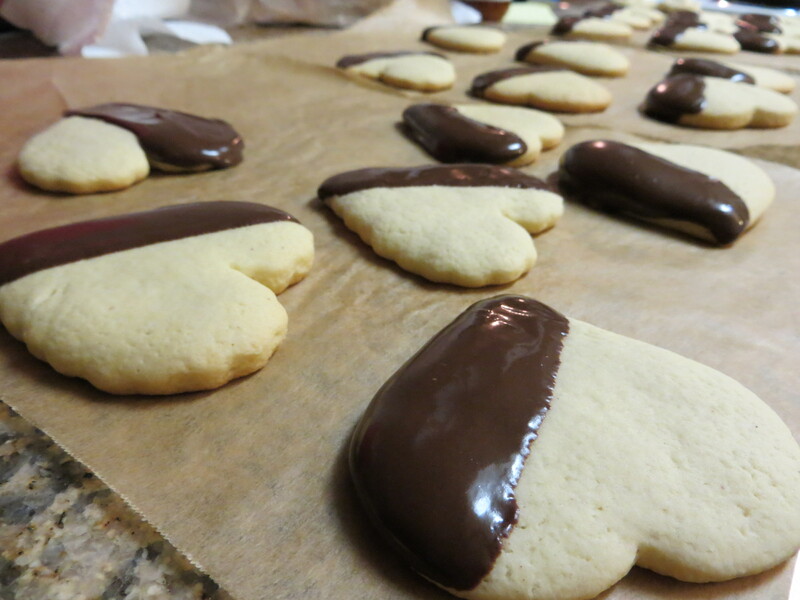 The basic cookies are beautiful and delicious by themselves, but I wanted to add a little extra decadence… so I dipped them in chocolate ganache. 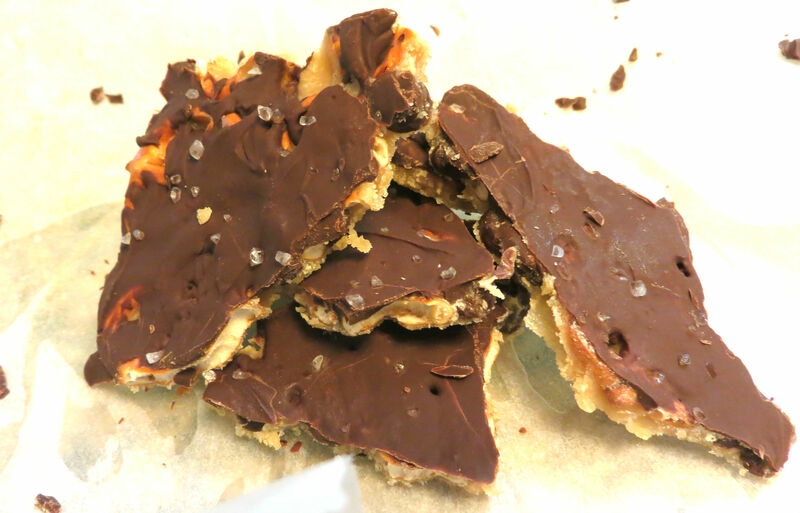 Unlike the sugar cookies last year, I submerged the bottoms of the cookies in chocolate (not just one side). 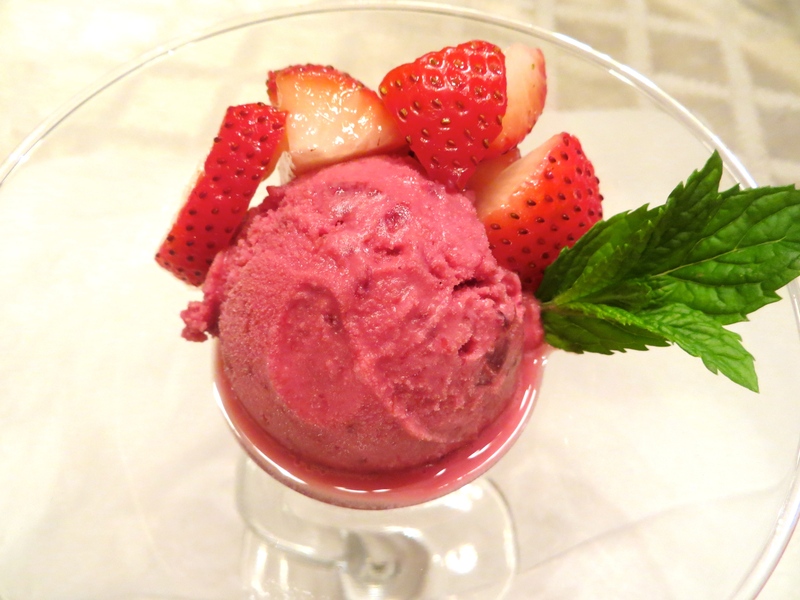 An elegant touch to a simple homemade treat! Just stick them in the fridge for a couple of hours to let the chocolate set! 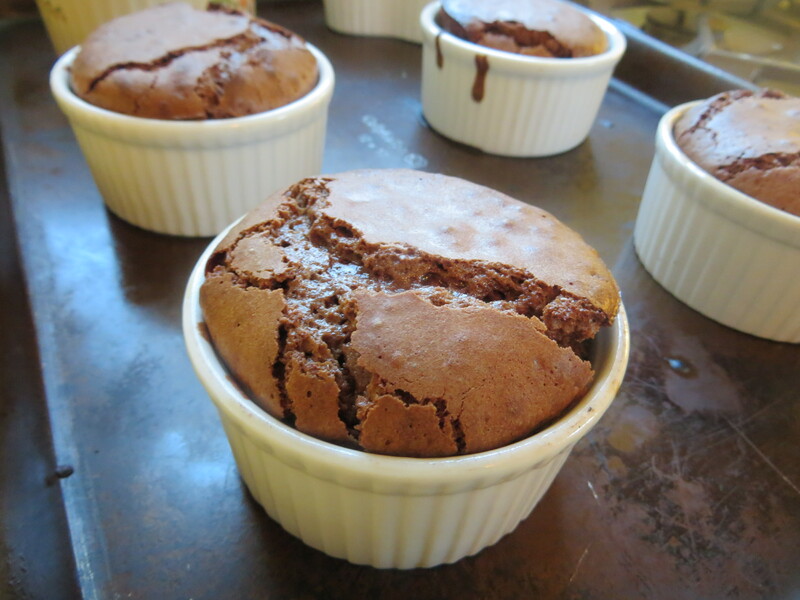 They are the perfect with a cold glass of milk and someone to share them with (or not… more for you!). Happy Valentine’s Day, everyone! I hope you have a wonderful day today, full of love, friendship, family, and joy! 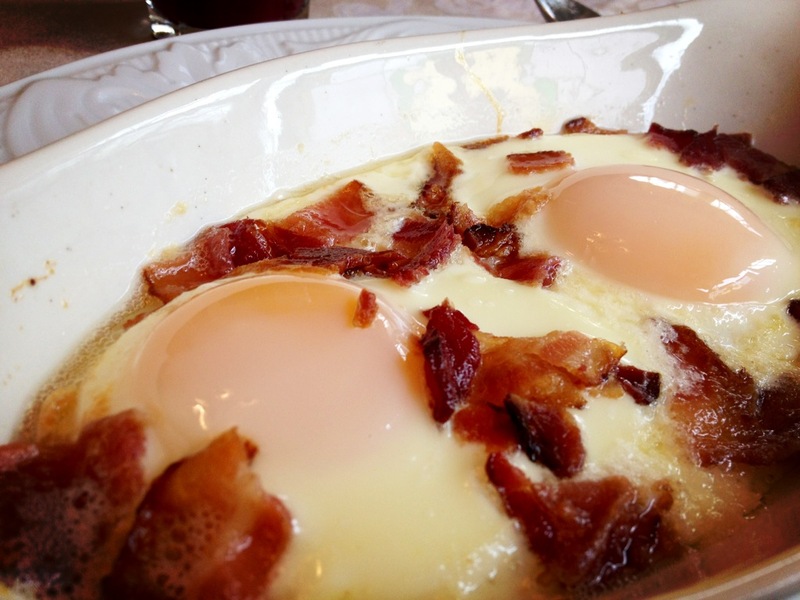 … because nothing says love like some baked œuf with bacon sprinkled on top. I shall give you the rundown of my Valentine’s Day festivities this weekend. BUT I want to know what you have planned for today! Are you having a romantic breakfast in bed with your sweetie? Or building heart-shaped snowmen in this apocalyptic snow we’ve been having? Or just having a little me-time with a good book and a large cappuccino? Let me know, kiddos! I hope everyone had a great Valentine’s Day! I was very lucky to have my only class cancelled and replaced with a short thirty-minute meeting in the late afternoon. Which meant that I could sleep-in, watch TV, and eat a bag of Hershey Kisses. Sadly, my internal biological clock did not agree and I was up at 7AM. With sleeping in not an option, I decided that I was going to make myself a celebratory Valentine’s Day breakfast… and it was one of the best things I ever made. I made ‘egg-in-a-hole’. Or ‘toad-in-a-hole’. Or ‘cut a circle in a piece of bread and fry an egg in it’. The name changes depending on where you live, apparently. 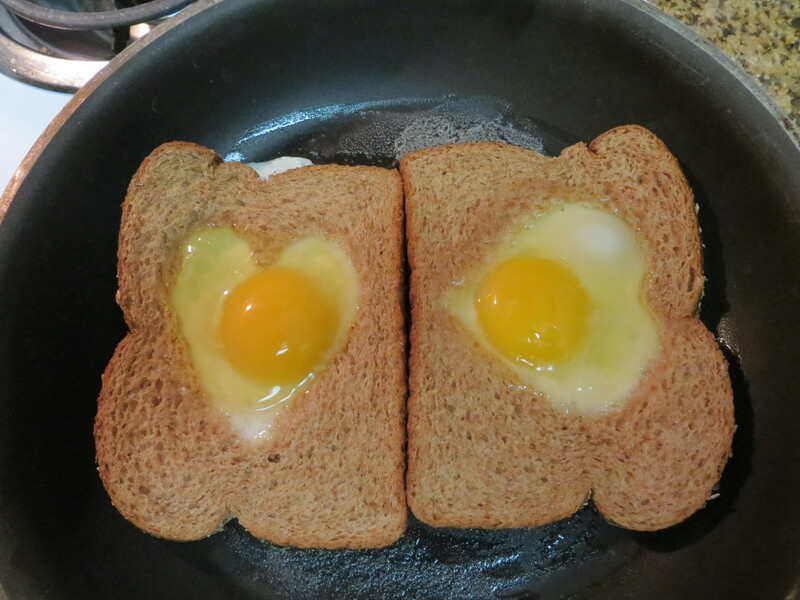 Despite the dispute over what it is called, ‘egg-in-a-hole’ is the perfect breakfast food because it finds balance. There is just enough butter-soaked bread for the runny egg yolk, and the egg and bread are all crisp at the same time. I love it. 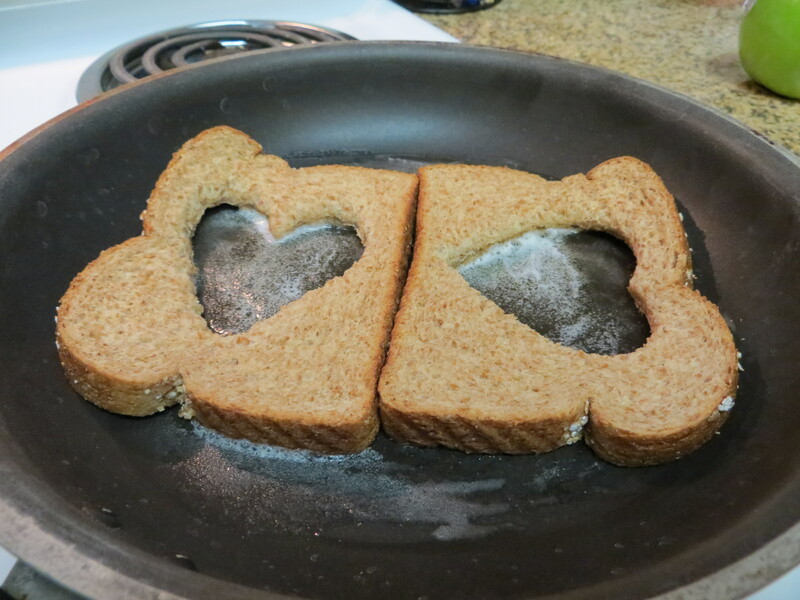 Because it was Valentine’s Day, I decided to put my new cookie cutters to good use and cut hearts in the bread for my ‘egg-in-a-hole’. It looked super sweet. I also couldn’t decide which heart I liked better, so I used both. I got a skillet really hot and melted some butter into it. Then I placed the bread in the butter and let it start to brown before I put the eggs in. Then I gently added the eggs so that the yolks (kind of) stayed centrally located. I let that cook for a couple of minutes so the egg whites could set. 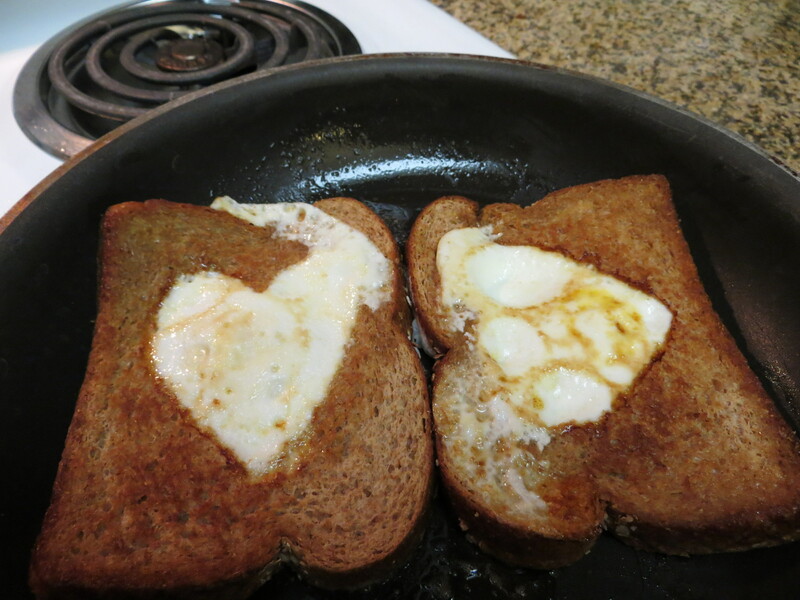 Then I flipped it over and was excited to see that most of the egg was contained in the heart! What did you guys do for Valentine’s Day? Wooed your sweeties with chocolates and expensive French fare? Or relaxed at home with a bottle of wine and good Chinese take-out? Let me know in the comments section! I hope everyone is okay after Super Storm Nemo whipped through the Northeast. My area only got about seven inches; not enough to keep me sequestered in the house, but it was enough to cast a spell of lethargy over me for the day. All I wanted to do was to stay curled up underneath the covers, drink gallons of hot chocolate, and watch old black-and-white movies. Since I had homework to do, laundry to fold, and no old movies to watch, I decided that I should be slightly productive and do some work. My productive streak ended right after lunchtime, when I decided that I would be a greater asset to society if I made cookies instead of doing my homework. My hand mixer came into my life when I was unwrapping my Christmas presents this year. I was almost brought to tears because my cousin outfitted my grad school kitchen with various implements that I had been sorely missing. It was the sweetest thing I had ever received. I was very excited because I never had a hand mixer of my own – and now I do! It is a delightful shade of avocado green, which brightens up my day every time I look at it. Despite my excitement, I was worried that it was not going to handle cookie dough as well as my stand mixer at home. 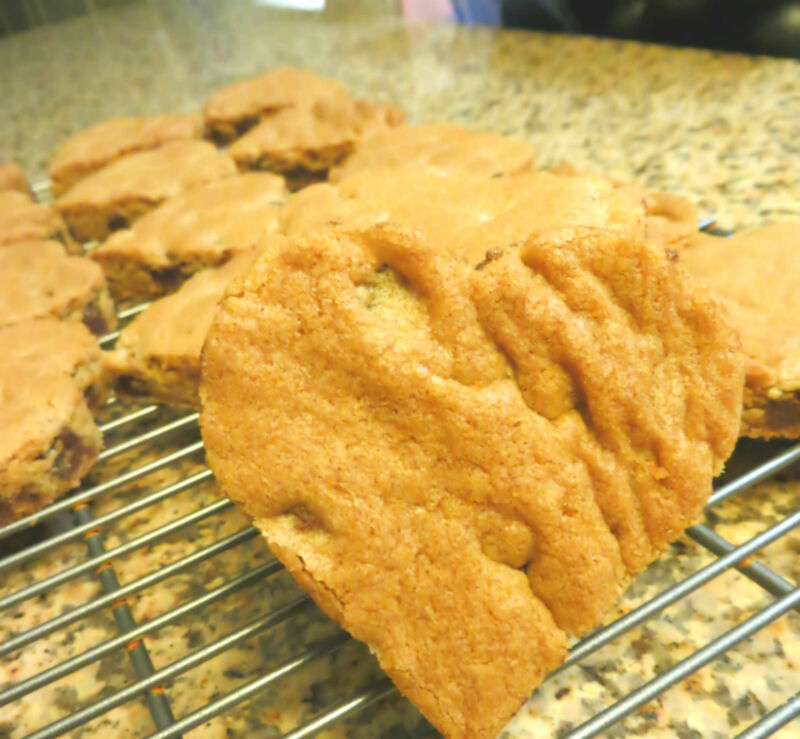 The test was my normal Sugar Cookie recipe, which I cut in half. And I was in for a pleasant surprise. The hand mixer handled the cookie dough well and I was able to get all the dough made and in the fridge in record time. All I needed to do was chill the dough, make the cookies and dunk them into chocolate. After an hour, my kitchen was covered with parchment paper and cookies. It was snow day baking perfection. To make up for the amount of melted chocolate and sugar cookie dough that I ate, I whipped up a batch of Greek chicken noodle soup. The soup base is similar to normal chicken noodle soup, only that it is thickened with a mixture of eggs and lemon (and cornstarch). It was perfectly tangy and warm, cutting through the butter/chocolate coma my body was beginning to slip into.